Roman Empire is first mentioned at Zemský trestní soud when the author describes the prosecutors as "the 1914 versions of Pontius Pilatus". Later on the empire is mentioned by the pious field chaplain in [I.12], by the author again in [I.14] (see Gallic Sea) and also on several other occasions. Overall this surely reflects the author's interest in ancient history and history in general. Roman Empire was a civilisation that developed from the city state of Roma, founded on the Italian peninsula in the 8th century before Christ. Through its life span of 1200 years, the Roman civilisation changed from being a monarchy to a republic to become an empire. It came to dominate Western Europe and the area around Mediterranean Sea by conquest and integration. The empire collapsed through foreign invasions in the 5th century, known as the end of the Roman Empire and start of medieval times. The Romarriket left a lasting legacy and is together with ancient Greece regarded the cradle of European civilisation. Formal remnants of the empire lasted until the age of Napoléon in guise of the Holy German-Roman Empire where several Habsburg rulers were nominal heads. Czech king Karel IV was also Roman Emperor. Imperium Romanum fuit res publica antiqua, cuius caput erat Roma, olim maxima mundi occidentalis urbs, et quae tempore maximae suae potestatis a Britannia usque ad Mesopotamiam extensa est. Ab Augusto Caesare imperium Romanum sic institutum est, ut gubernare rem publicam uni principi solo sit. [1.3] Vracela se slavná historie římského panství nad Jerusalemem. Vězně vyváděli i představovali je před Piláty roku 1914tého dolů do přízemku. Jerusalem is mentioned by the author when he describes the staff of Zemský trestní soud as "1914's variation on Pontius Pilatus". Jerusalem was at the time of Pontius Pilate capital of the Roman province of Judea. [1.3] Vracela se slavná historie římského panství nad Jerusalemem. Vězně vyváděli i představovali je před Piláty roku 1914 tého dolů do přízemku. Plzeň is mentioned indirectly in connection with the Pilsner beer that the staff of the Zemský trestní soud get from Teissig. Later in the novel the city's name appears again when Švejk mentions the execution of the gypsy Janeček. Plzeň was one of the most important industrial centres in Austria-Hungary. It was the monarchy's primary weapons forge and Škoda delivered the bulk of the heavy artillery to K.u.k. Heer, and even supplied Germany. The city is nowadays best known for having given name to the Pilsner beer that has been brewed since 1842 and has now become a somewhat imprecise term for pale, bottom-fermented beers. The best known brands that are made in the city today are Pilsner Urquell and Gambrinus. Plzeň was in 1913 a city of 80,343 inhabitants of more than 85 per cent registered as Czech nationals. It was the centre of the hetjmanství and okres of the same name. More than 1,000 military personnel were at the time stationed in Plzeň, which was also home of the 35th infantry regiment. The Pilsen hetjtmanství counted 156,073 souls. Jaroslav Hašek visited Plzeň in summer 1913 together with Zdeněk Matěj Kuděj. The two writers sought out Karel Pelant, editor of the weekly Směr. He owed Hašek money for a couple of short stories but tried his best to avoid meeting the two. In the they tricked him into appearing at U Salzmannů and he ended up paying the restaurant bill for his guests after an allmighty party. The two stayed there for a couple of days and visited an impressive number of pubs. Plzeň was the final destination of a trip that had started in Prague and gone via Loděnice, Beroun, Nový Jáchymov, Rakovník, Ziroh and Rokycany. Most of it was done on foot and Kuděj describes the trip in his book Ve dvou se to lépe táhne (1923-24). Hašek mentions the editor in the story O upřímnem přátelství, albeit without mentioning his name (nor does Kuděj). [1.3] A vyšetřující soudcové, Piláti nové doby, místo aby si čestně myli ruce, posílali si pro papriku a plzeňské pivo k Teissigovi a odevzdávali nové a nové žaloby na státní návladnictví. Botič is mentioned in the anecdote Švejk tells his cell-mates at Zemský trestní soud. He had been assaulted by a bridge over this stream in Nusle, having been mistaken for someone else. Botič is a stream in the south-eastern part of Prague. It ends in the Vltava by Vyšehrad after flowing through Vršovice and Nusle. Most přes Botič is mentioned in the anecdote Švejk tells his cell-mates at Zemský trestní soud. He had been assaulted by the bridge across Botič in Nusle. Most přes Botič was one of the bridges across Botič in Nusle. The main bridge for pedestrians was the one carrying Havlíčkova třída from Královské Vinohrady to Nusle. This was also the bridge that was closest to the centre of the town. Podolí is mentioned is the same anecdote as U Bansethů and Botič, indirectly through the local church: Podolský kostelík. Podolí is since 1922 a district of Prague. It is located on the eastern bank of the Vltava between Vyšehrad to the north and Braník to the south. To the east is Pankrác and Nusle. Podolí was until 1922 administratively part of Královské Vinohrady. In 1913 it was a town of 4,038 inhabitants in hejtmanství Královské Vinohrady, okres Nusle. far. ves na pravém bř. Vltavy pod posvátným Vyšehradem, hejtm. a okr. Král. Vinohrady, pš. Pankrác; 110 d., 1854 ob. č. (1890), s Dvorci 187 d., 3515 obyv. č., 13 n., 6 ciz. (1900), starožitný kostel sv. Michala archanděla ze XIII. stol., šk. o 10 tř., průmyslová pokračovací škola, zastávka parníků, čtvery vápenice (v nichž se vyrábí též hydraulické vápno, zvané »podolské«, a portlandský cement), cihelna, továrny na dlaždice, falcované tašky z cementu, fermeže, oleje a tuky, čistírna peří, pražská a vinohradská vodárna. [1.3] Votevřel si klíčem podolskej kostelík, poněvadž myslel, že je doma, zul se v sakristii, poněvadž myslel, že je to u nich ta kuchyně, a lehl si na voltář, poněvadž myslel, že je doma v posteli, a dal na sebe nějaký ty dečky se svatými nápisy a pod hlavu evangelium a ještě jiný svěcený knihy, aby měl vysoko pod hlavou. Kladno is partly a theme in Švejk's story about the police chief Rotter who trained his dogs on tramps. Kladno is an industrial city west of Prague and was a vital hub of the labour movement even under Austria-Hungary. It was from here that a failed Communist coup and general strike was organised in December 1920. Hašek was designed by Komintern to play a role in it but arrived a few days after the coup had been put down. Hašek knew Kladno from before the war, and on 29 June 1914 he and Josef Lada visited Rotter, the above mentioned policeman! 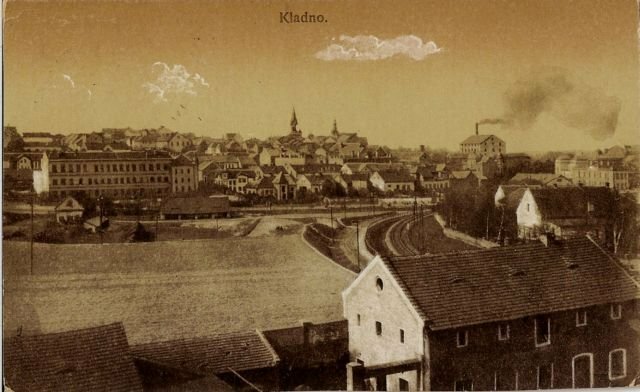 In 1913 Kladno's population was 19,369, and nearly exclusively Czech. There was also a certain military presence. The town has the seat of both the hejtmasntví and okres carrying its name. Militarily it was part of Ergänzungsbezirk 28, Prague. [1.3] Taky vám dám příklad, jak se na Kladně zmejlil jeden policejní pes, vlčák toho známého rytmistra Rottera. Kladensko is part of the anecdote about Rotter and his police dogs and the experiments with letting the dogs chase down tramps. Kladensko is the Czech name of the Kladno district west of Prague. Hašek visited the area on 28 June 1914 together with Josef Lada. See Kačák for more information. Kladensko was probably a term that was synonymous with okresní hejtmanství Kladno, a region counting 80,785 inhabitants distributed across the two judicial districts Kladno and Unhošť, totalling 45 local communities (1913). [1.1.3] Taky vám dám příklad, jak se na Kladně zmejlil jeden policejní pes, vlčák toho známýho rytmistra Rottra. Rytmistr Rotter pěstoval ty psy a dělal pokusy s vandráky, až se Kladensku počali všichni vandráci vyhejbat. Lánské lesy is mentioned in the same story as Kladno, about police chief Rotter and his dogs. Lánské lesy is a forested area by Kladno, named after the nearby town of Lány. See Klandesnko. [1.3] Tak mu přivedli jednou tak dost slušně ošaceného člověka, kterého našli v lánských lesích sedět na nějakém pařezu. Pacific Ocean briefly enters the story when the commission of court doctors ask Švejk how deep the Pacific is at its deepest. In [III.3] the ocean is mentioned again in the anecdote about Koudela. Pacific Ocean is the largest of the world oceans and also the deepest ocean on earth. The point Švejk is asked about is the 10,911 metres deep Mariana Trench. In 1914 fighting occurred in the Pacific Ocean and Germany was soon forced to abandon her colonies there, almost without bloodshed. At the outbreak of war, the German "Pacific Fleet" (Ostasiengeschwader) was ordered to sail home, but nearly all the ships were sunk on the way. Austria-Hungary had one vessel in the Pacific. S­MS Kaiserin Elisabeth was sunk by its own crew on 2 November 1914 during the Japanese siege of the German navy base Tsingtao. Vyšehrad enters the dialogue when Švejk answers the psychiatric commission that Pacific Ocean must be deeper than Vltava below Vyšehrad. Vyšehrad is the oldest part of Prague, known for the historic fortress. It is located on a rock by Vltava, between the current districts of Nové Město and Nusle. The national cemetery is also located here. In 1913 this city district was identical to the VI. district in the royal capital, officially called Královské Vyšehrad. The district had 5,252 inhabitants, and almost all of them were Czechs.